Had a couple of short session on the H.Avon recently. I have been spending more time looking and feeding the barbel rather than fishing. The river has been painfully low this year and it’s only the prolific weed growth that has kept flow back. Without this we would be in dire trouble for sure. Walking one day I found 14 barbel feeding in different places. Small groups of fish. Some as large as 13lbs and some half that weight. The weather had been so hot and humid that walking is an effort but that’s what I’ve been doing. I fished for a few barbel in a difficult mid river swim. There were a few chub and 5 barbel. Previously in the morning I had seen a monster however it was not present when I cast out under the weedbed. I only had about 90 minutes of fishing time so limited to a couple of casts. First cast I pricked a barbel as it shot out from under the weedbed. Then I hooked a small chub that got stuck in the weed a few times. The following day I only had 2 hours again. I returned to a swim where I had seen 3 barbel and had them feeding hard on pellets. Now the trick is to lower your bait under your own bank quietly so as not to disturb the swim. So trap is set. Then over the next few minutes throw out some pellets so that the barbel come out from under the tree branches. Then slowly bring them closer to your own bank. This worked a treat I had practiced this the previous day. Sure enough the barbel came out all 3 of them one small one plus 2 that are larger with one that might be a double. There were several chub feeding hard too. I was hoping that the chub didn’t pick up the bait. 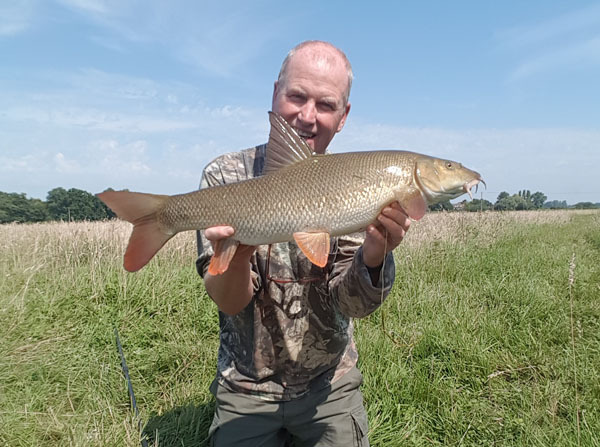 I could see the barbel coming up on my line of bait, then it was close, followed by a huge tug on the rod end and the free spool singing away. Quickly it got through a little weedbed and tried to get into the trees on the far bank. The fight was great from the smallest of the 3 and I was a little disappointed. Still seeing the take and fight in the crystal clear river compensated for this. And landing one barbel from the H.Avon by design is an effort in itself. A right little splasher was landed and weighed in at 7lbs 2oz. All of this happened in about 20mins. I fished another spot for a couple of big chub but they were all over the bait but didn’t get any hook-ups. This entry was posted on Thursday, July 20th, 2017 at 7:46 pm	and is filed under Uncategorized. You can follow any responses to this entry through the RSS 2.0 feed. Both comments and pings are currently closed.